We will take you to the real Japan! AKIHABARA, HARAJUKU, and more! This is a very family friendly tour. We cater to everyone of all ages, so young children and even our older, more experienced guests will enjoy our tour. We have a guide that can speak your native language "English, Spanish, French, and Japanese", so you have access to all the information they have available. Through our tour, we will provide an unforgettable explanation of all things Japan which you won’t be able to find in your guidebooks. Dress up in a Kawaii Kimono & Stroll around the romantic townscape of Asakusa. 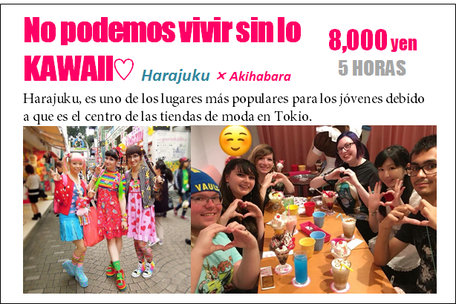 A través de estas 3 ciudades que simbolizan a Tokyo hoy en día, daremos a conocer un poco más de su historia y cultura, ya que hay muchas cosas que aún no se saben sobre esta. ¡Los esperamos! © copyright 2017 AKIBALAND TOURS. All rights reserved.